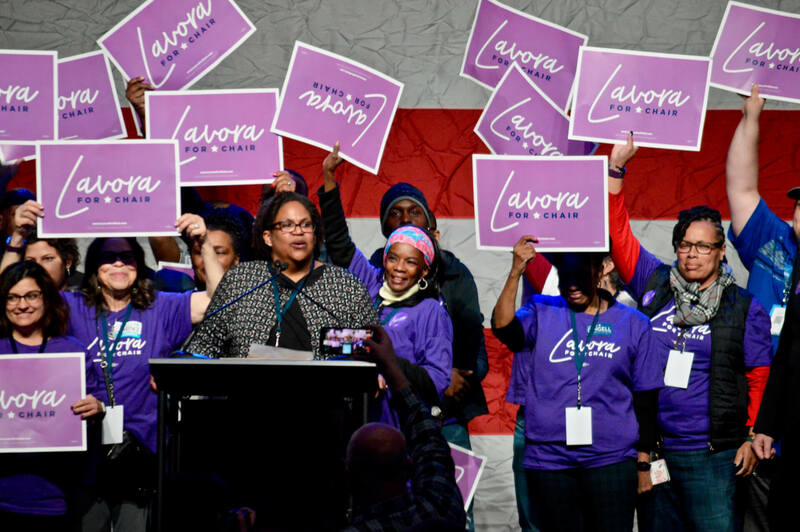 Lavora Barnes made history Saturday as she became the first African-American woman to lead the Michigan Democratic Party. Barnes replaces Chair Brandon Dillon, who opted not to run for re-election. Almost 3,000 credentialed delegates attended the party’s biennial convention, which was held at Cobo Center in Detroit. Barnes, who lives in Ann Arbor, earned more than 70 percent of the delegate vote in a three-way contest. She is now the third Black woman to helm a state party in the country, joining Louisiana state Sen. Karen Carter Peterson and Maya Rockeymoore Cummings, who was just elected in Maryland. Barnes, who has been the MDP’s chief operating officer since 2013, also is the first woman to lead the state party since Olivia Maynard, who held the post from 1979 to 1983. That comes as Michigan is the only state in the country to have four top female executives: Gov. Gretchen Whitmer, Attorney General Dana Nessel, Secretary of State Jocelyn Benson and Michigan Supreme Court Justice Bridget McCormack. And Barnes becomes the first African-American MDP chair since Melvin “Butch” Hollowell, who was co-chair with Mark Brewer from 2003 to 2004. The other two nominated chair candidates were Greg Bowens, a precinct delegate and 14th Congressional District executive committee member, and Lisa DiRado, a member of both Northville Indivisible and the 11th District Democrats. Two other candidates had been running, MD Alam, chair of Muslims for [Bernie] Sanders and Patrick Biange, a former gubernatorial and congressional candidate. Barnes was considered the heavy frontrunner, having earned endorsements from, Dillon, Gov. Gretchen Whitmer, Lt. Gov. Garlin Gilchrist II, Attorney General Dana Nessel, the UAW and the AFL-CIO. And as the Advance first reported, all nine members of Michigan’s Democratic congressional delegation backed Barnes, which hasn’t happened in a contested race since 2013 when Lon Johnson ousted Brewer. Barnes did communications for former President Bill Clinton and ran former President Barack Obama’s 2012 Michigan presidential campaign. In her victory speech Saturday, she sought to emphasize party unity. Democrats are looking to turn the state blue in the 2020 presidential election after President Donald Trump’s surprise 2016 win in Michigan. They also elected other leadership posts, including officers for party caucuses and congressional districts. Mark LaChey was elected MDP first vice chair and Fay Beydoun is second vice chair.